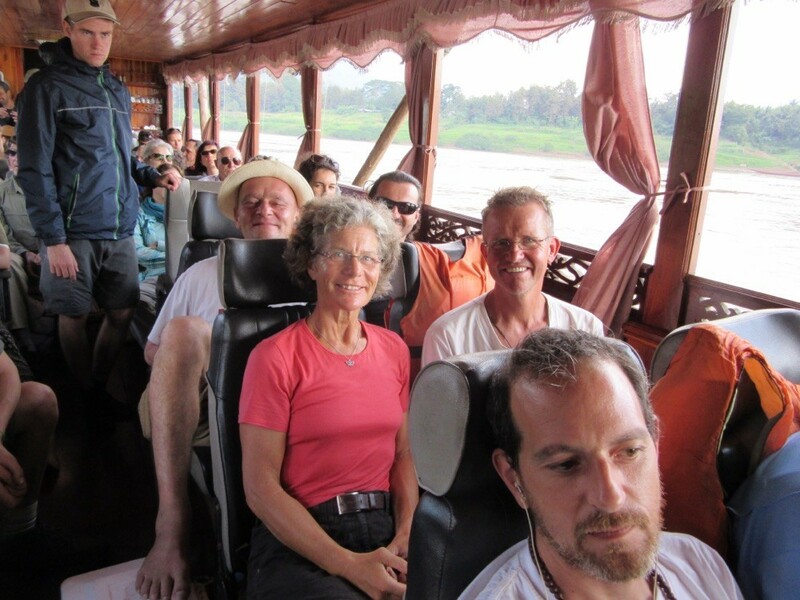 On the 26th December we crossed the border into Laos and took a boat on the Mekong River to Pakbeng. It was rougher than we thought but the captain was good and steered the boat safely through all rapid. Our first day of cycling was amazing. What a country! The people so friendly. The streets better than expected and again everything so different. The good thing about cycling is that you can stop whenever you want. When you cycle through a village the children always greet you with a happy " sabbaydee" and sometimes I stop and try to communicate with them. Or I stop to help a little bit with their work. They have to do a lot, like peeling the corn. 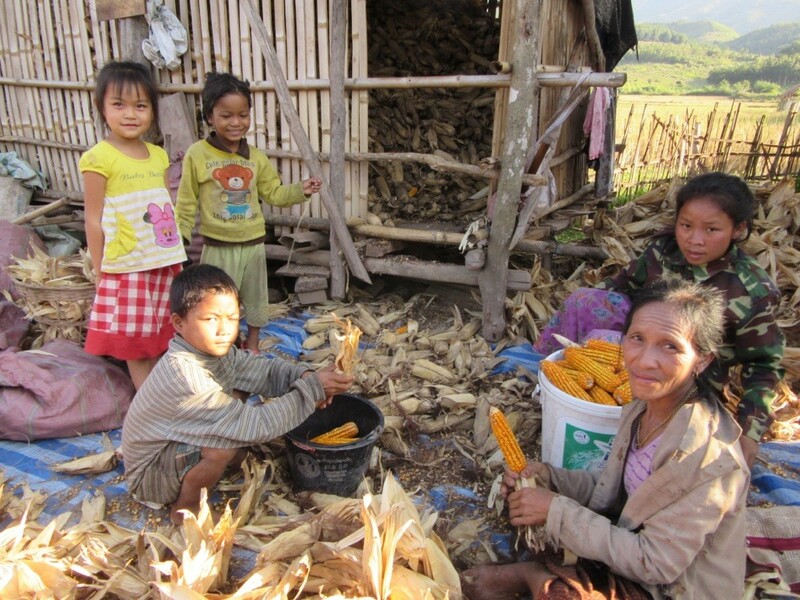 Children also have to help, fetch water, collect wood, look after younger siblings, sell things , work in the fields. 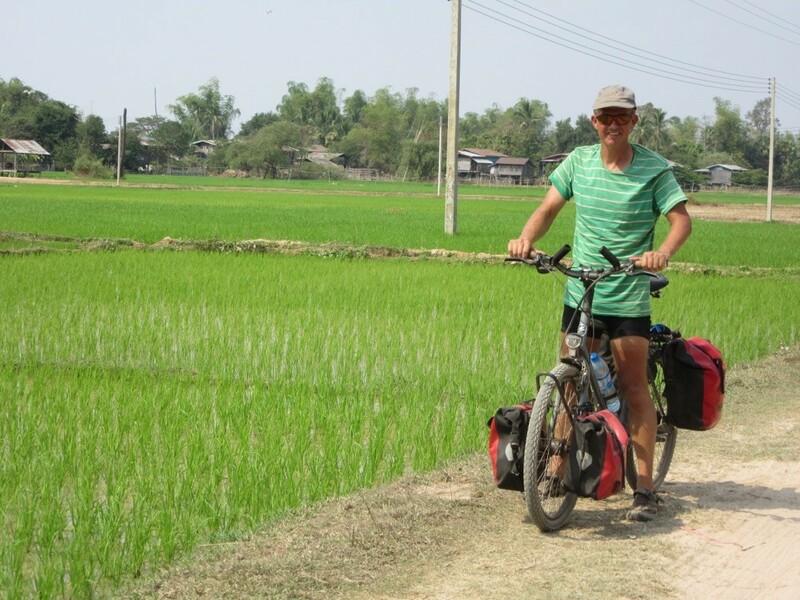 We cycled three days with Greg, a young man from England. That was really great. Here in odoumxai I watcht he sunset. 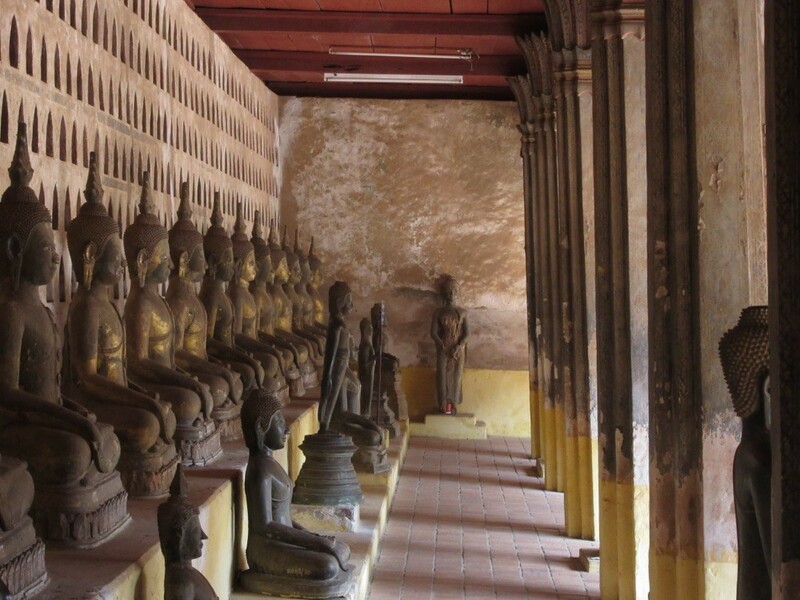 There aren't as many temples in Laos as in the other countries. Before Nong Kjiaw Greg went a different way. We enjoyed the mountains a lot and celebrated new year there. I went up to an amazing view point. 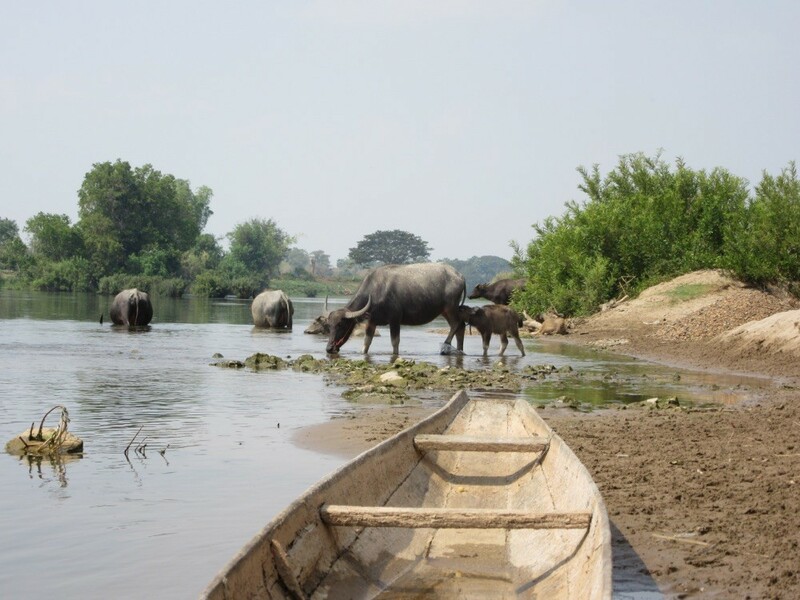 We also went on a day trip to a remote village and saw these water buffaloes. Fantastic! 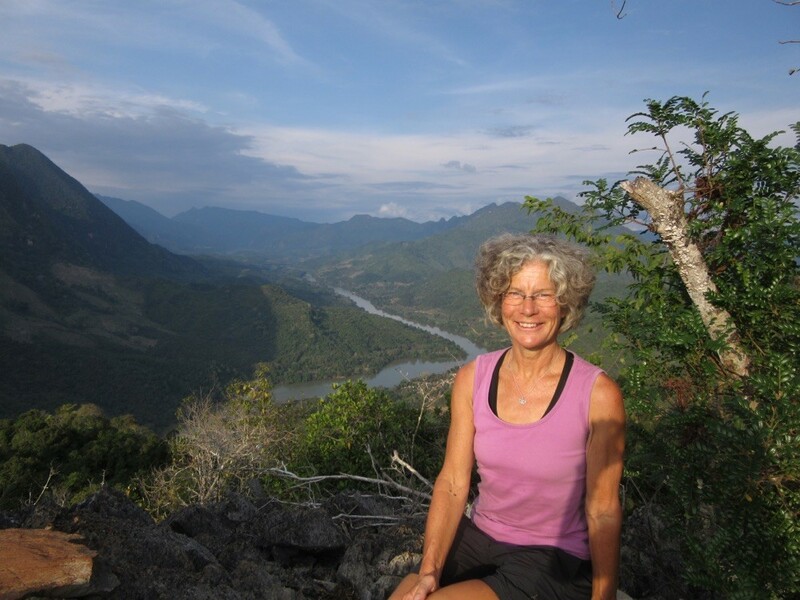 On the first of January we took a boat on the Nam Ou direction Luang Prabang but because there is a hydro power station now we could only go half way on the river and then had to take a minivan. 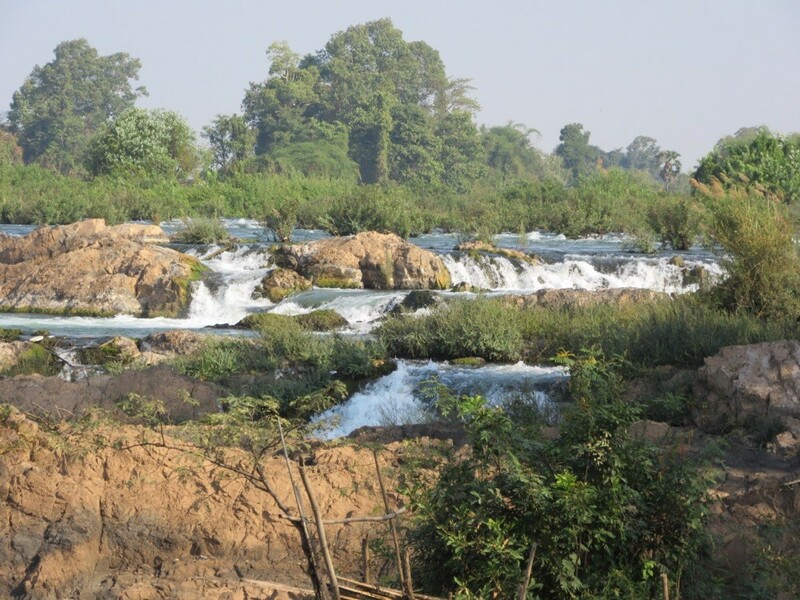 Very sad as the river once was the prettiest of Laos. 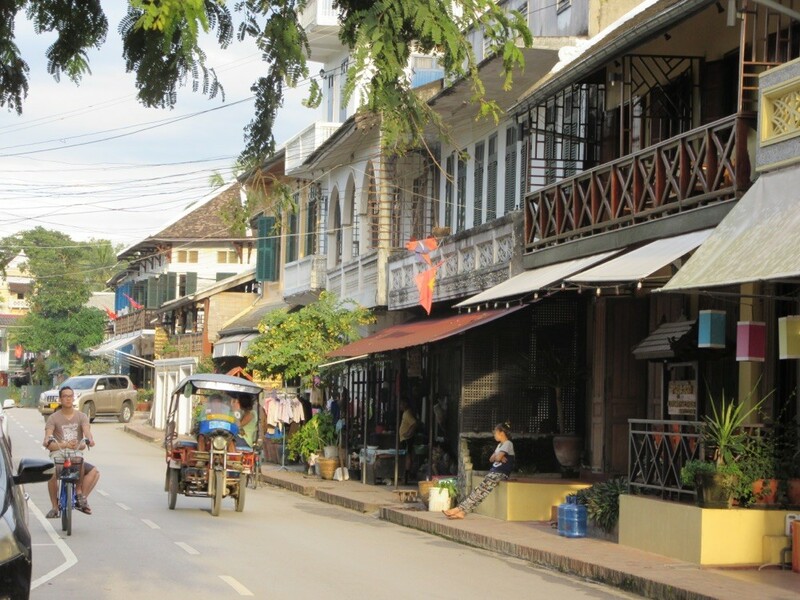 But now we are in Luang Prabang, the nicest town in Laos. Everything is well kept and there are so many bakeries with delicious cakes that I think I want to stay a bit longer. 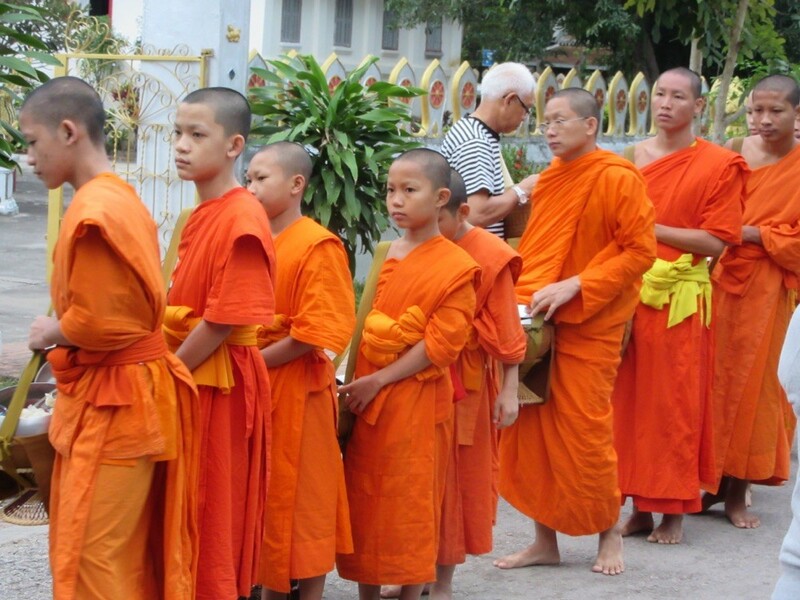 This early morning I went to see how the monks get their daily food, a very strange procedure, because hundreds of tourists watch them and take photos, me included, shame on me. After breakfast we went on a little bike trip to an elephant camp. We didn't ride on them but fed and watched them which also was a lot of fun! They are amazing animals that need to be protected as their numbers have decreased to only 500 in captivity and about 600 in wilderness. 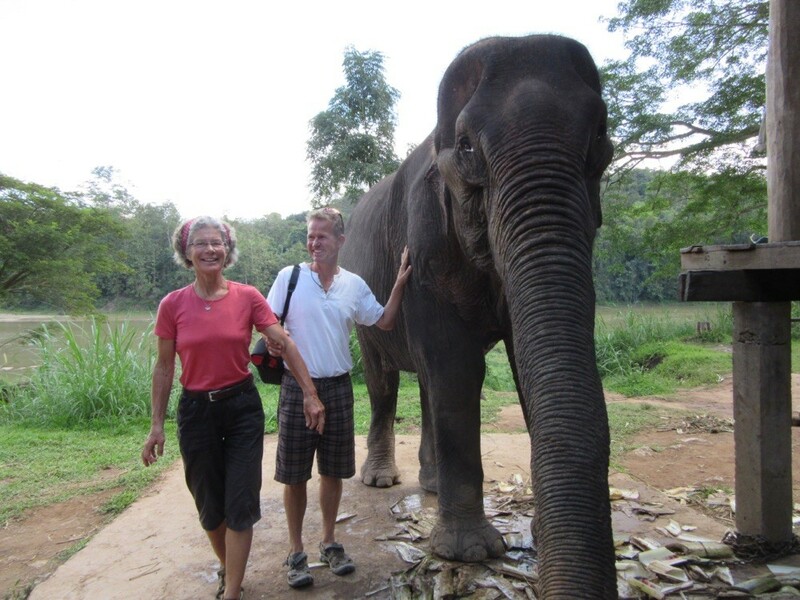 And Laos used to be the land of elephants! 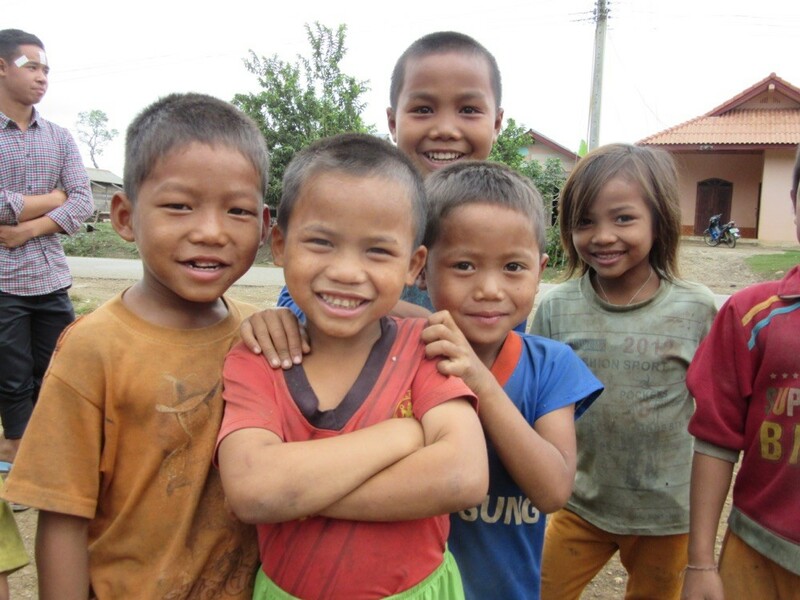 As Laos is a country where people are not used to reading there are many projects to teach them and spread books. For example " Big Brother Mouse ". Many young people are keen on learning English so they provide that too. Here I am in their office to talk to two students to improve their English. And I myself learned a lot about their lives here. 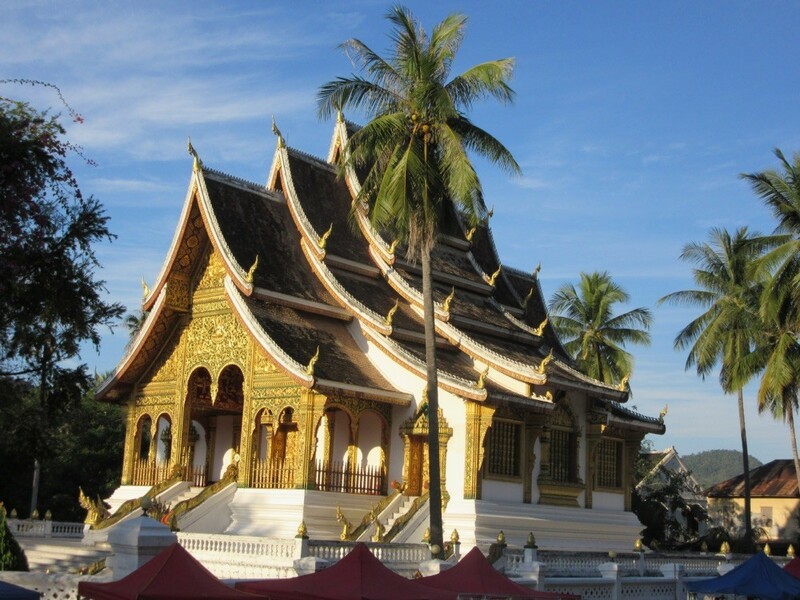 Luang Prabang has many beautiful and precious temples, it also is a world heritage site. So it is a pleasure strolling around the town and visit some places. 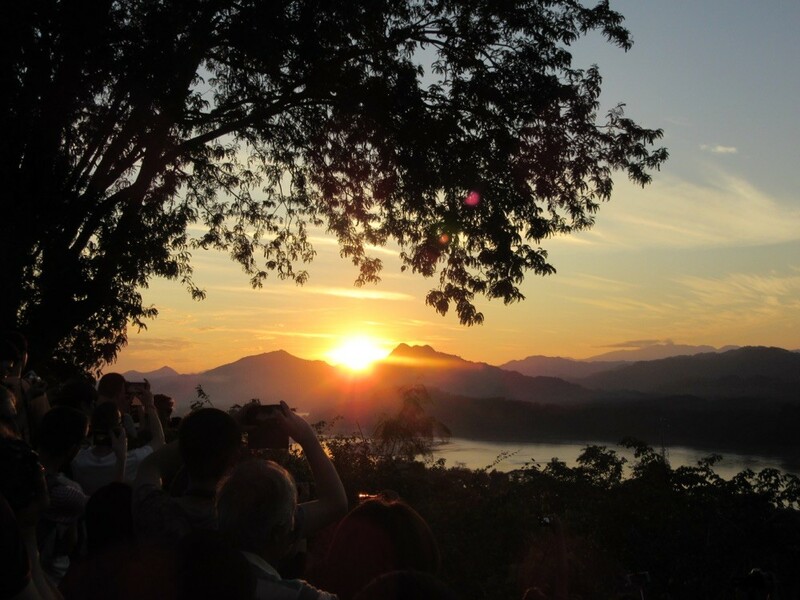 In the evening we went up Mount Phousi to watch the beautiful sunset together with about two hundred other tourists. Anyway, it was worth it. Afterwards we were hungry. 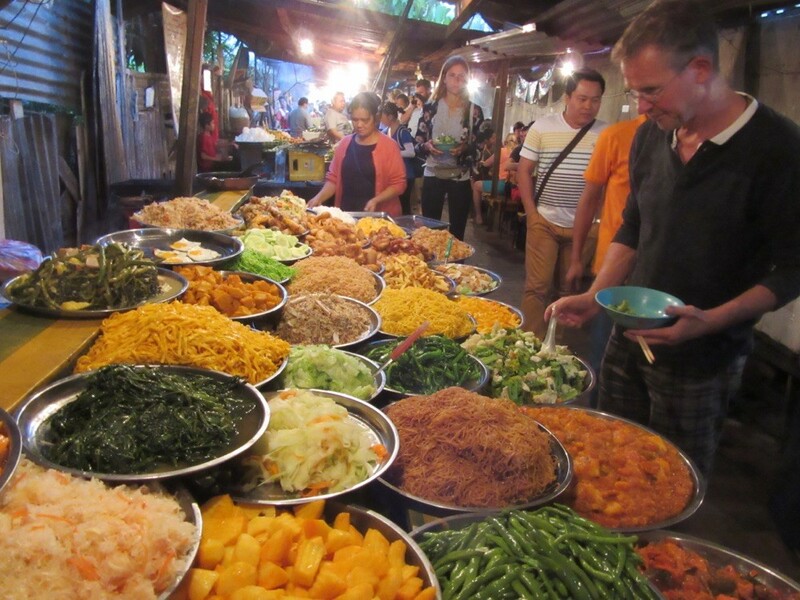 The best place to eat is the night market as they have wonderful vegetarian buffets and also lots of barbecues for people who like to eat any kind of meat, we are not sure about meat here as we saw strange things on the market in the morning ( rats, frogs, guinea pigs and so on). 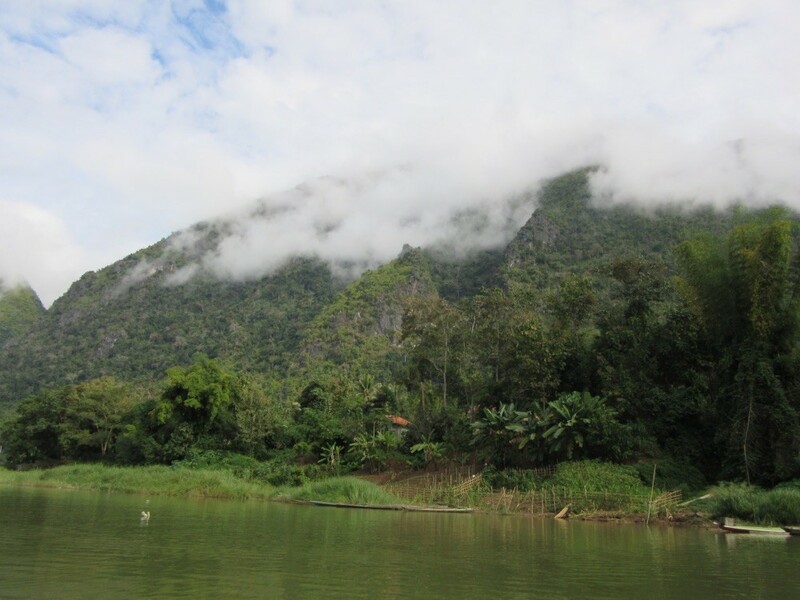 Then we started crossing the mountains towards Vang Vieng which would take us three days. The first one was the hardest because the last 20km were uphill ( before it was mixed) but the road was great and not busy at all ( although it was the main road from north to south). Again we were able to watch the daily lives of the people in the villages. They have such a basic and hard life but seem to be happy with it. 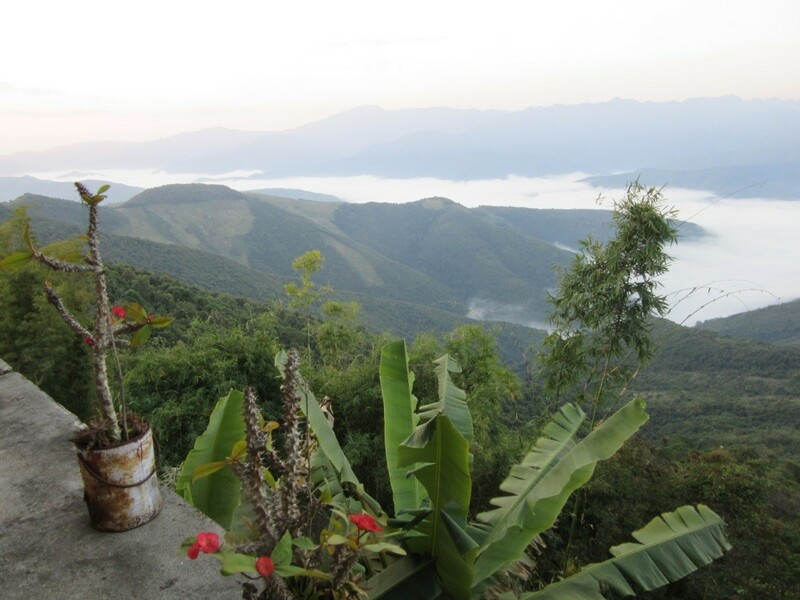 The first night we stayed in a really rotten guesthouse in a village on the mountains. But the view next morning was fantastic and the cycling also. We were high up most of the day passing little villages clutching to the mountains and had gorgeous view ever so often. And then the best part came, downhill to the next village where we were to stay in a nicer guesthouse which was next to a hot spring. There we relaxed our tired legs and later watched the locals having fun in the pool. Day number three was quite easy then, not too many hills, lovely landscape, nice little villages and lots of agriculture. We arrived at Vang Vieng in the early afternoon and kind if took the first guesthouse we saw because it had a pool and was out of town. We didn't want to stay in the party zone. 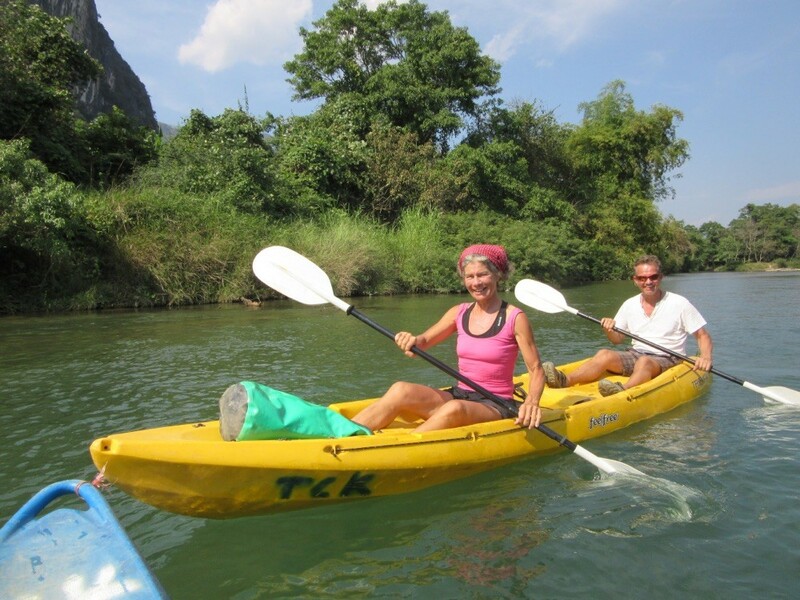 After the kayaking day in Vang Vieng we had to cycle two days to get to the capital, Vientiane. There we finally found the winter in front of a mega shopping center, which was empty. But next to the place was the old market, crowded. The population is not ready for the future yet. There were many interesting temples there, I especially liked this one with 10000 of small and big Buddha statues. 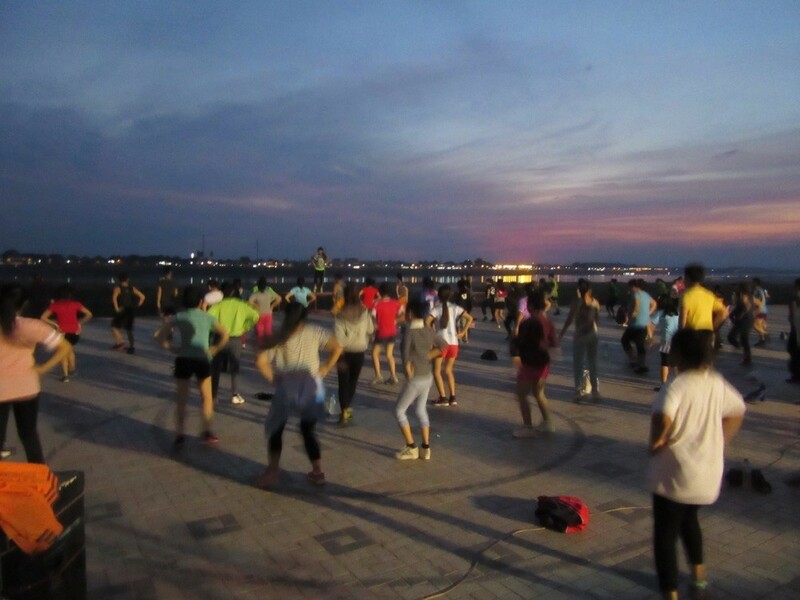 And I liked the evenings on the river bank because the wer really good aerobics classes ( and I am an aerobics teacher myself). They also had a night market and delicious food. 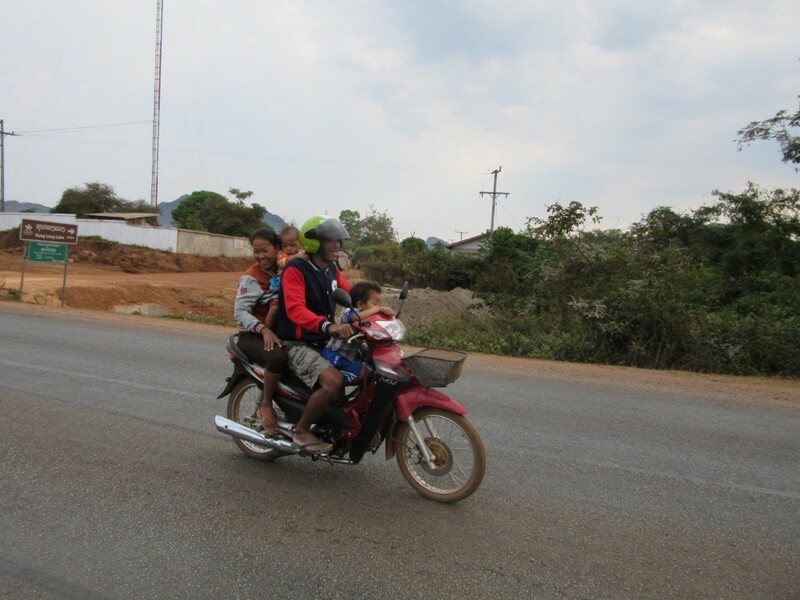 Going on was medium exciting and it took three days to reach our next destination, Thakhek, a little town on the Mekong close to some nice mountains. 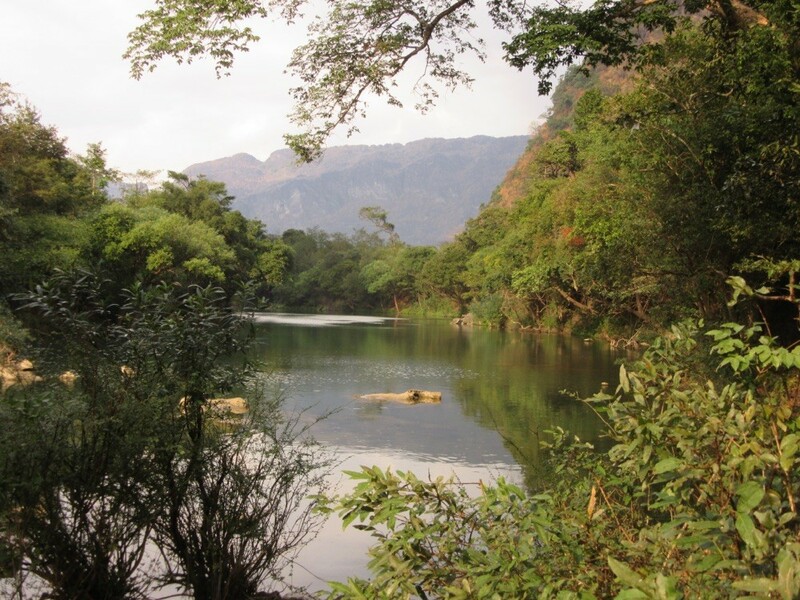 On our day trip we found this wonderful clean river for swimming and enjoyed a relaxing day. 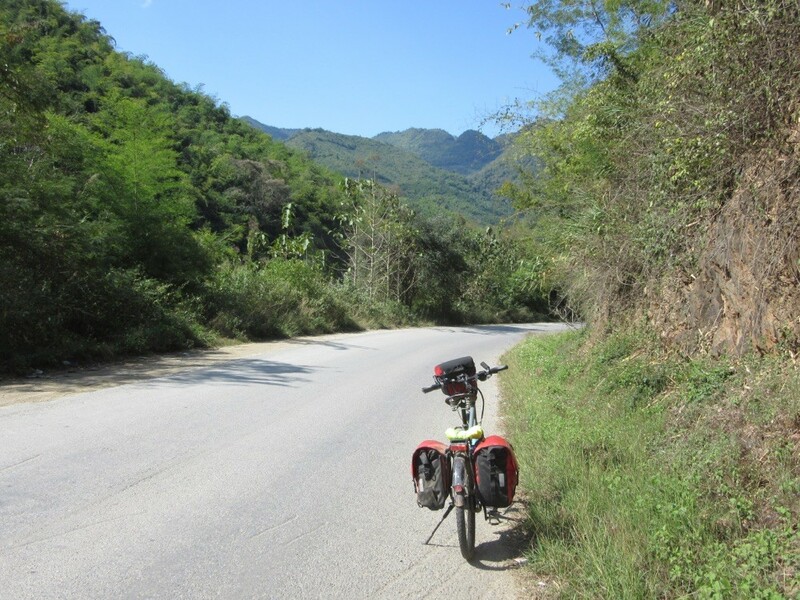 On 16th January we cycled 105km along the Mekong. 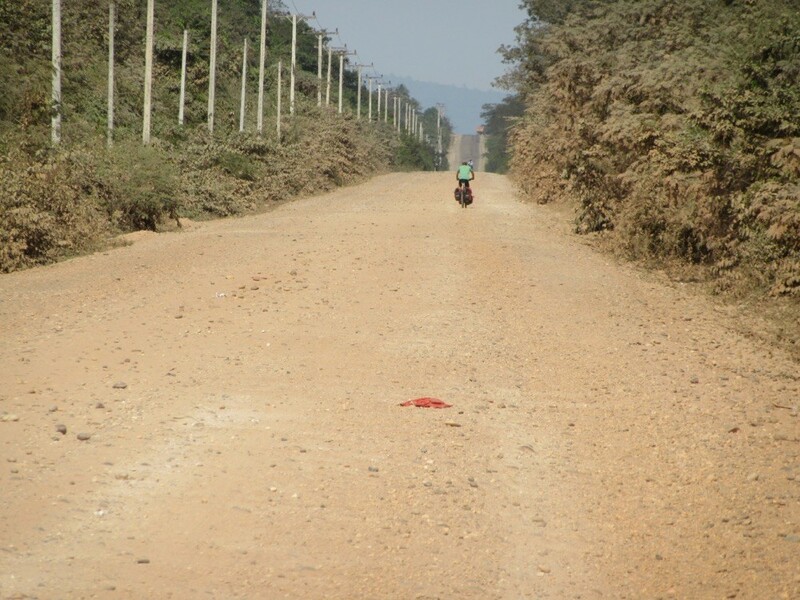 It was a wonderful road passing many little villages where we could see the normal lives of the locals. Very often you would see a whole family on one scooter. 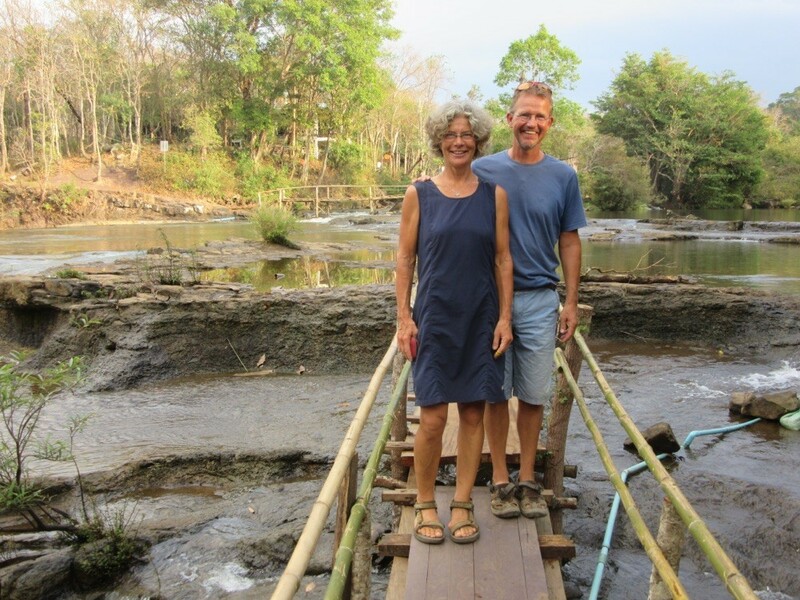 Then we went to the Bolaven plateau. 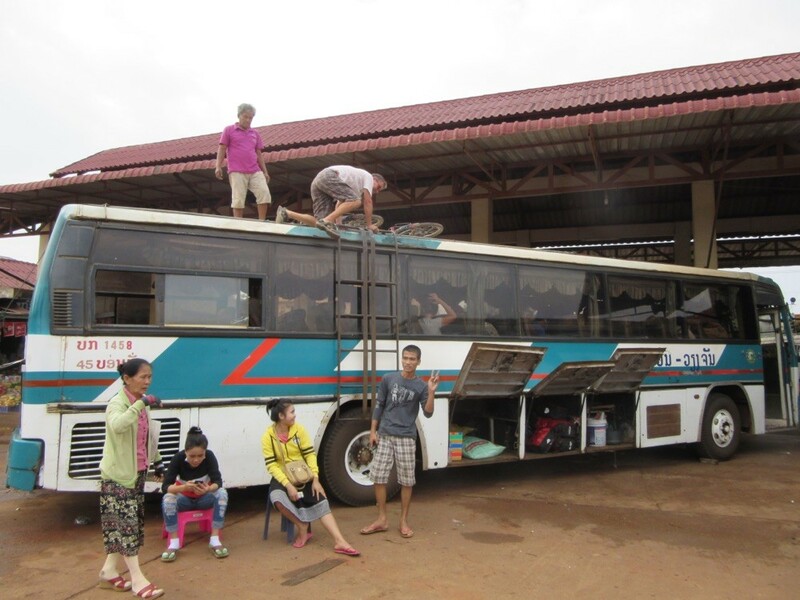 In order to save time we took a bus which is always a hassle with the bikes on the roof. But w stayed at a lovely place, TadLo, near a waterfall where we met a nice Canadian couple who were also cycling around and gave us lots of tips for the next days. In the late afternoon we went to the elephants at the next hotel and fed them and watched when they bathed. 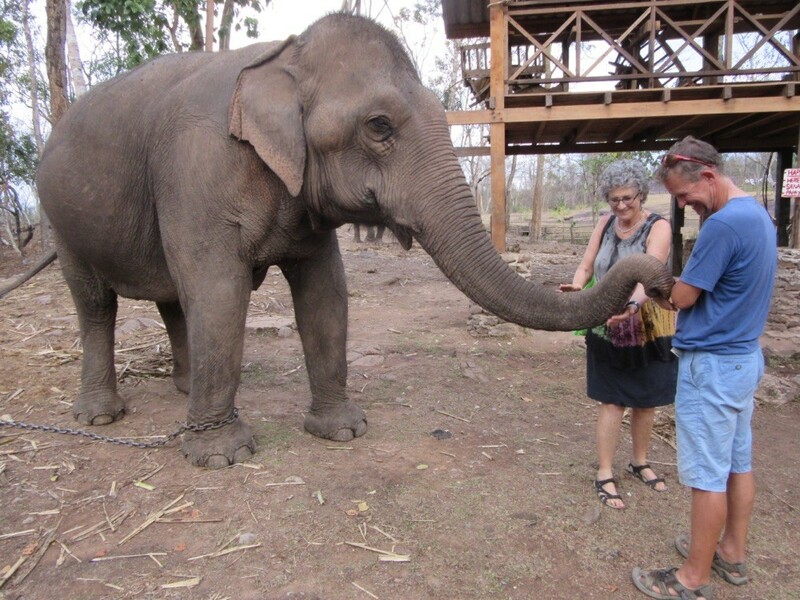 They were wonderful animals and in much better shape than the ones at Luang Prabang. 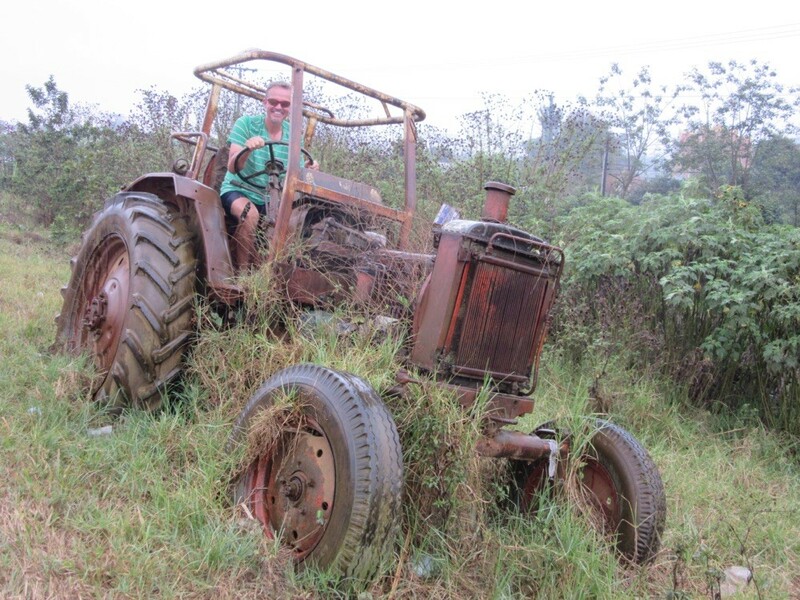 Unfortunately we had to go on the next day but Arne found a better vehicle on the way. I don't know if he will reach Cambodia with this one! Anyway we had a nice cycling day although it rained a lot in the afternoon. But tomorrow will be our last day in the mountains so we didn't mind. 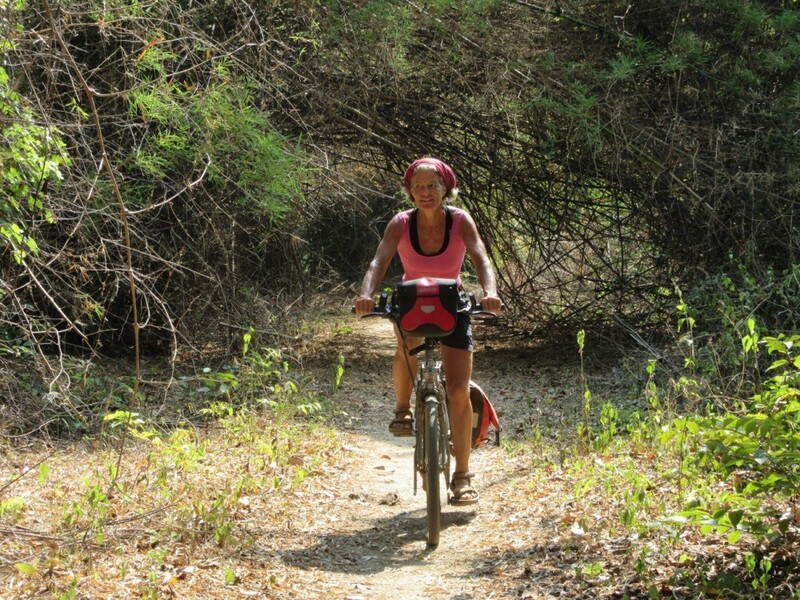 We cycled to Champasak, an ancient kingdom city on the Mekong. Well, you could not call it a city, it was rather a village but very nice. Here we met another really nice cycling couple from Holland. 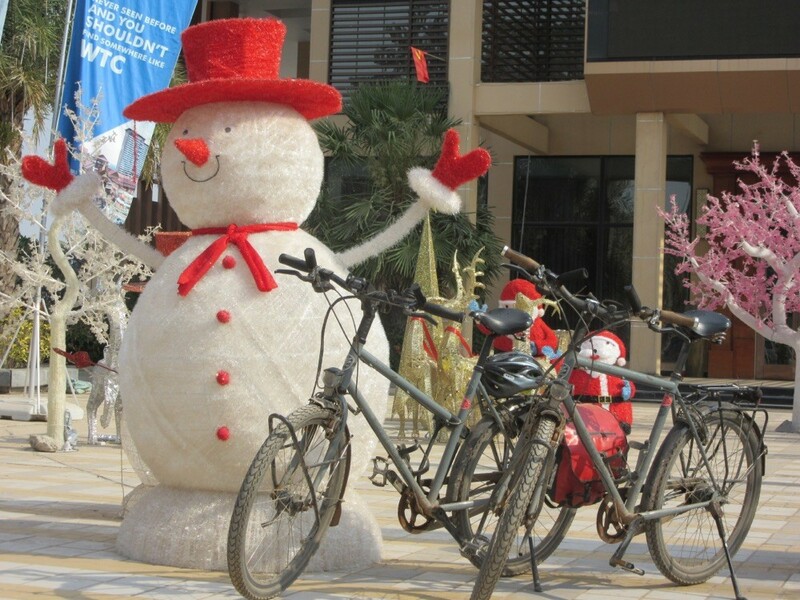 Yes, people who cycle are nearly always nice! The next morning we visited the nearby world heritage site Vat Phou, an old Khmer temple, very impressive. 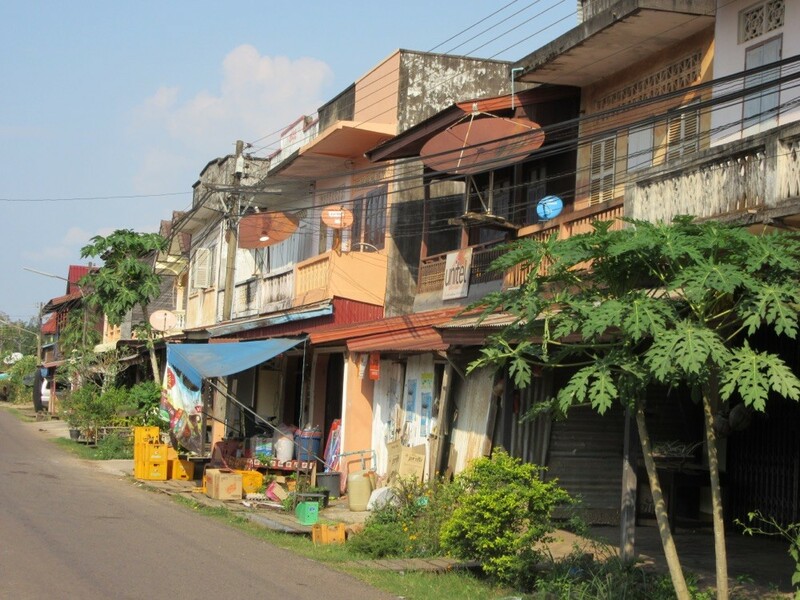 We went on direction south along the Mekong, which was a bit like a lottery as we never know where there are ferries across the river or guesthouse stop stay at night. 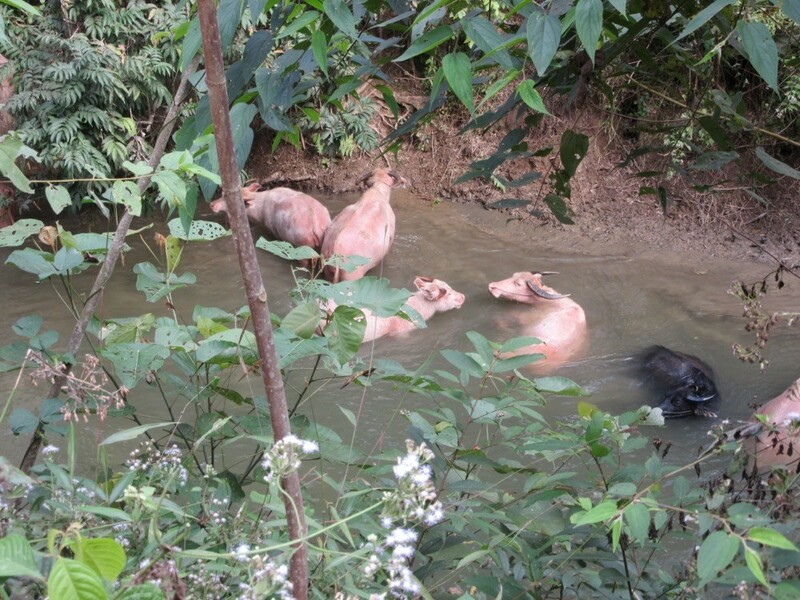 But the scenery was fantastic and we often stop to swim in the Mekong, even when the water buffaloes do the same! Then through a few rice fields and here we are on the fourthousand islands, a famous backpacker place to relax and enjoy the river and the heat. 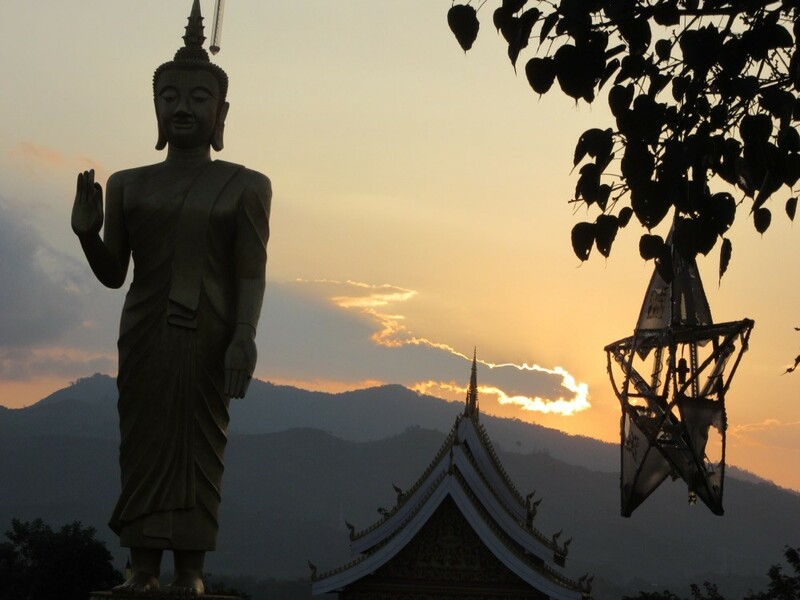 Only one more day in Laos then we have to go to Cambodia. 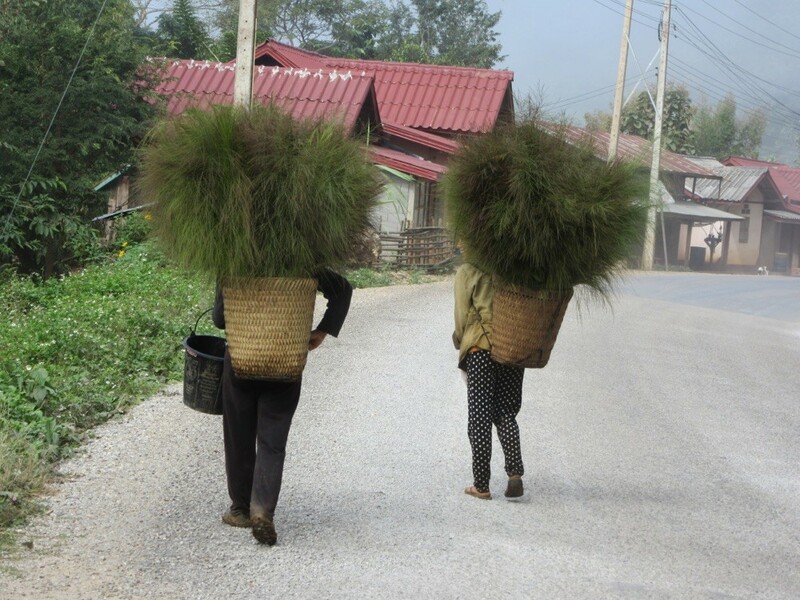 These are the " Niagara Falls " of Southeast Asia! Although they look small they are quite impressive. And considering the fact that they destroyed the French people's hope to find a water way to China they are of great significance. 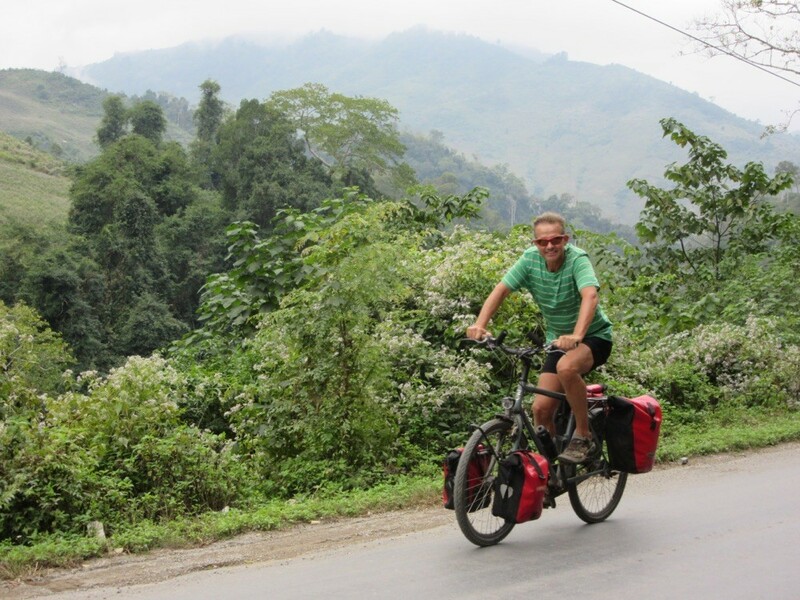 Anyway we had a wonderful last day in Laos cycling around the islands, swimming in the Mekong River and relaxing on our bungalow terrace. 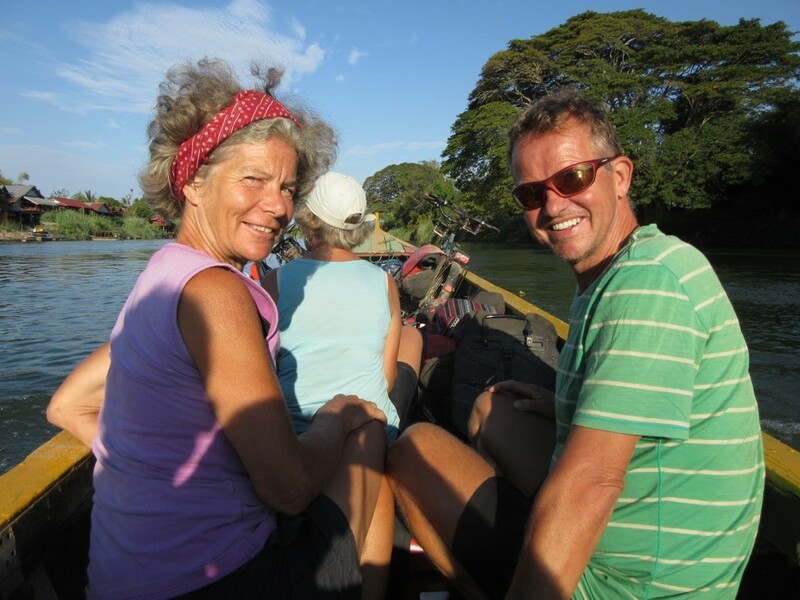 We also met a nice couple from holland with whom we spent the evening and cycled on to Cambodia. 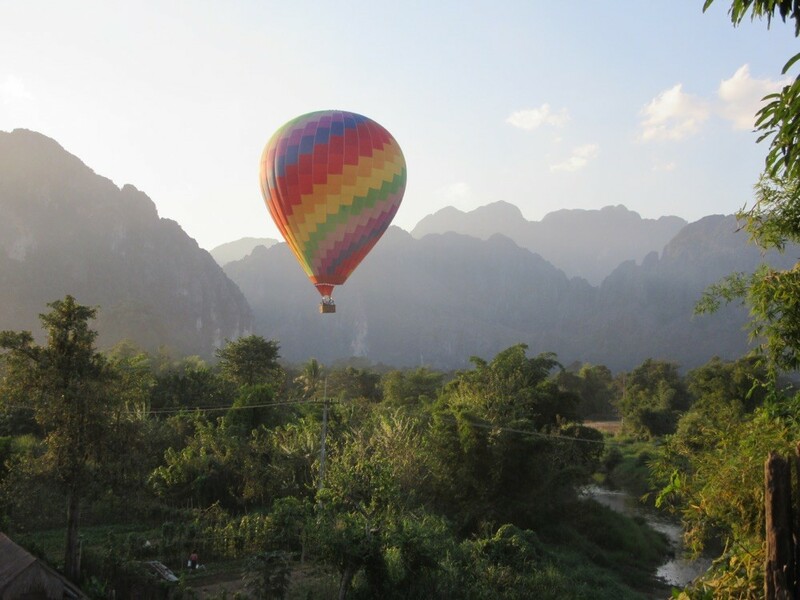 On Sunday, 24th January, we had to leave Laos because our vis expired. First we had to take a boat to the main land again and then cycle 14 km south on the empty road 13. Luckily the Dutch couple could change us some Euros into dollars because this border crossings was so remote that there was nothing. 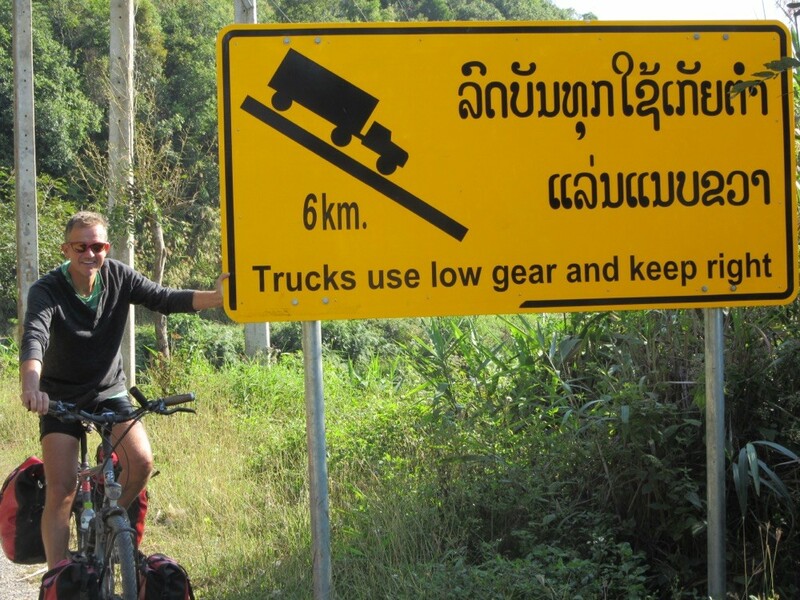 So that's how 1730 kilometers in Laos ended, what a wonderful time! Nach 18 Monaten "Ruhepause" geht es für drei Wochen wieder auf das Rad. Es geht ins Baltikum. Die Anreise gestaltet sich überaus einfach. In Lübeck-Travemünde auf die Fähre und 28 Stunden später erreichen wir den Hafen von Liepaja (Lettland).